Hmmm could these be the initials of the title? "The Rise After Victory"? "The Rebellion Against Vader"? He said only one person was looking in the right direction, then started to spell this out. I suspect maybe someone named Travis (or similar) responded to one of his tweets and was on the right path. Also, I don't think we should assume Daniels was talking about the title for Episode IX. I remember seeing for the first time that fan art piece showing Rey with a mechanical hand holding her staff with Luke's saber on her waist - volcanic eruptions and lots of ash - it read The Last Jedi at the top. That was more than a year before eight came out. A different take on "Spark Of Hope"
Great title for an ending .. Seems like blue is the color a lot of photoshops and stuff are using regarding the title, but that orange really pops. I wouldn't mind purple either, but that orange one especially looks cool. With us posting these title suggestions somebody propably is close to what it will become hehe ..
Ehhhh... I dunno... too easy to mock up and fake. 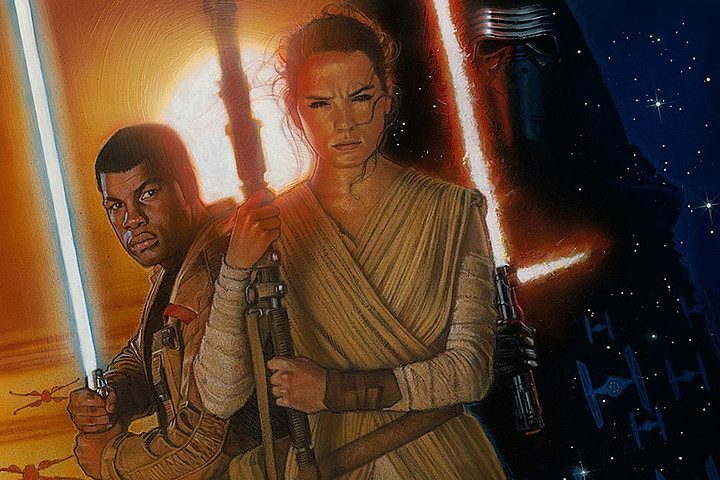 Nah that is just a rip off the Struzan Celebration poster for Force Awakens. I was lucky enough to be there to get one so I recognized that pretty instantly. Although props to whoever made that for incorporating the red lines on Kylo's mask. Though it would have looked better if some of the design elements went outside the border, like in the other posters. Obvs fake but still kinda cool.